Once upon a time, in 568 AD, Italy was invaded by men with very long beards. 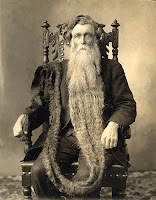 The Italians called them langobards, from the Latin Longa Barba (long beards). This was shortened to Lombards, and so successful was the invasion that part of Italy is known to this day as Lombardy. Invasions, incursions, revolutions and risorgimenti have terrible consequences for undefended minorities and small businessmen (by which I mean men who run small businesses, not entrepreneurial dwarfs). History is written by the victors, not the barbers; yet we may be sure that such universal hairiness destroyed the incomes of the North Italian barbers, whose business it was to cut off barbas. The Italians probably deserved to be invaded, they had for centuries been invading others and spreading their Latin lexicon to the far corners of Europe. The conquered Iberians spent a thousand years licking their salted wounds and then set off across the Atlantic to continue the cycle of abuse*. They discovered a little island whose name, in the native language was Red Land With White Teeth; and, realising that this was a ridiculous moniker, decided to call it Beardypeople, which was much more fitting and sombre. Nobody is quite sure why they called it Beardypeople. 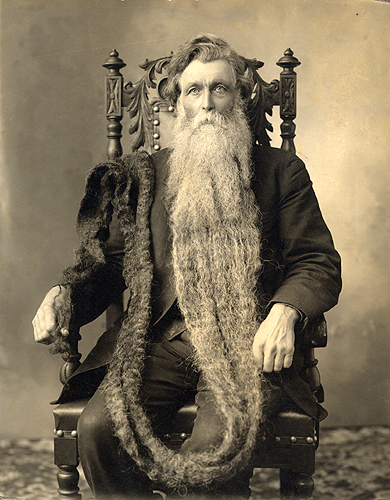 Some say that the people had beards. Others say that this is ridiculous and that it was the trees that had beards (the Giant Bearded Fig grows there). Others again say that it was the reefs surrounding the island that had beards of foam. Whatever the truth is, Beardyones in Spanish is Barbados. And, of course, barbed wire is, etymologically, bearded. *A cycle of abuse is like a normal bicycle, but it has a megaphone attached through which one can shriek obscenities at pedestrians. Also Babar the Elephant - who was far less successful as a Hairy Mammoth. p.s. I found a hair once in my Rum Baba ... coincidence? I think I may be going insane. I distinctly remember writing a post on barbarians and rhubarb and now can't find it, even in the drafts on Blogger. Your whim is my command. See - isn't that better? We love you even more now !